Our goal is to not only be the Best Indian Restaurant in America, but in the entire World. Dine at the newest contender for the title of #1 Indian Restaurant in the World. The Culture Trip | 11 Restaurants For Valentine's Day In L.A.
Our city's fanciest Indian restaurant might belong to Dr. Puneet Chandak and wife Sonia Batra, who debuted Spice Affair in late 2014 on Beverly Hills’ Restaurant Row. dineL.A. Restaurant Week returns for the second time in 2016 from July 18 – 31, featuring over 300 options for lunch and dinner. American Express is also sponsoring an Exclusive Series of restaurants featuring special menus that start at $95. You’ve only got 28 meals to work with. Here are my recommendations for every slot. Make your calendar count. I’ve always driven by Spice Affair on La Cienega’s Restaurant Row and been so curious to try their modern Indian cuisine. 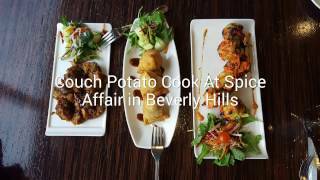 So when I finally got the chance to dine at Spice Affair in Beverly Hills, I wasn’t disappointed. The gorgeous restaurant serves up equally picturesque and delicious dishes by Michelin recommended Anupam Bhatia and La Confrerie de La Chaine des Rotisseurs Bronze Medal Winner Nimish Bhatia. It’s no wonder USA Today‘s 10Best.com named Spice Affair as one of the best Indian restaurants in Los Angeles. Spice Affair offers a fascinating amalgam of old and new Indian cuisine in a beautiful setting. Chefs Anupam Bhatia and Nimish Bhatia quickly made their marks with their creative offerings, as Spice Affair was rated the #1 restaurant in Beverly. India and around the world will be celebrating Diwali, the Festival of Lights, on Sunday. For most, this includes elaborate celebratory meals in the days leading up to the holiday and after, often at home. But if you don’t have an Indian grandmother (or grandfather) to cook for you, here are four restaurants in the Los Angeles area where you can partake in the culinary festivities. And they each represent different regions of Indian cuisine. The award-winning Spice Affair restaurant on La Cienega’s Restaurant Row, features an elegant dining room and lounge along with a large banquet hall and serves classic Indian dishes with a modern twist. For Valentine’s Day they are offering a special five-course menu with specialties like the kasoori methi lobster and the traditional Indian paneer asharfi korma. One of my favorite things about living in LA is the vibrant and varied restaurant scene. (Duh–I’ve been a restaurant critic for two decades now–of course I love that!) I’m always happy to welcome new entries into the mix. To that end, I attended two really different openings recently, each with its own unique crowd and vibe, but both packed to the rafters. I’ll try my best to make some time in my crazy busy schedule to go back and do a full review of each in the near future, but for now, a look into their openings will have to suffice. Owner Sonia Batra gave Sandra Mitchell a taste of how the Spice Affair restaurant celebrates Diwali. An upscale Indian Dinner at Spice Affair on La Cienega in Beverly Hills, Los Angeles – vegetarian options, cocktails, and valet parking. It’s been a long time since I’ve gone out for Indian food. Usually we order take-out/delivery, but not last weekend. John, Sam, Abe and I ventured to La Cienega’s Restaurant Row for a peek at the new Spice Affair. Brand new upscale Indian cuisine restaurant, Spice Affair hosted an evening of distinctive Indian delight….the pairing of finest fashion with flavors and food…A fashion night with tantalizing hors d’oevres to tickle your taste buds. A spotlight of fashion couture paired to match the hues and flavors of the food. Help spread the word about this fantastic place with authentic Indian Food, Culture, Decor and a fabulous event space for parties and weddings. Spice Affair opened last week and took the place of Tanzore, another modern Indian eatery in Beverly Hills. This eatery will be similar by being an upscale Indian fusion restaurant with a lavish lounge, VIP private dining room and banquet Hall on La Cienega's Restaurant Row. Open for lunch and dinner, with a lounge menu and full bar, choose between traditional dishes like Tikka Masala and Tandoori Chicken or experience signature breads like Gruyere Cheese and Curry Leaf Pesto Naan or Indian street food like Aloo Papdi Chaat which incorporates spiced potato on Papdi bread with a trio of chutneys and yoghurt. For more on the menu click here. Spice Affair also offers happy hour from 3 p.m. to 7 p.m., including $5 drinks and small plates, and a Champagne Brunch Buffet on the weekends. Hours of operation are Sunday to Thursday 11:30 a.m. to 10 p.m. and Friday and Saturday 11:30 a.m. to 11 p.m. Additionally, Spice Affair offers delivery or take-out and will book private events for any special occasion. That isn't your everyday taco on the plate at the top. The wrapper is an Indian bread called phulka, and the filling is chicken tikka masala. It's lounge food at the new Indian restaurant Spice Affair on La Cienega Boulevard in Beverly Hills. Replacing Tanzore, with new owners and management, Spice Affair tweaks Indian food with contemporary and California touches. A wine list and innovative cocktails carry out its brand, "an Indian indulgence." To the left of the taco is sev puri, stuffed with white peas and sprinkled with fine strands of sev, a fried Indian snack made from chickpea flour. With such a bustling restaurant scene in L.A., sometimes it’s hard to know where to go for your next amazing meal. Let me give you a tip: Spice Affair on La Cienega. You’re welcome. Don’t let the name scare you; this restaurant is not about blowtorching your taste buds with ghost chili and habanero confit. Michelin-recommended Chef Anupam Bhatia brings a medley of exotic and rich flavors to your mouth with a California twist. Spice Affair is an upscale, fine dining, Indian experience. I call it an experience because frankly there’s no other way to put it. With stunning Brazilian agate on countertops and hanging on walls in their lounge bar, to the wafting of aromatic spice blends, you are sure to have an evening filled with wonder and epicurean delight. Spice Affair serves up Indian cuisine with a modern California twist on La Cienega Boulevard, Beverly Hills' Restaurant Row. This expansive establishment encompasses a dining room with booths and tables, a private dining room and a banquet hall with its own entrance. (Both private spaces are outfitted with projectors and retractable screens.) Guests who linger in the lounge area and at the luminescent bar can order from a separate menu of fusion small plates, including a chicken tikka masala taco with homemade chapatti serving as the shell. There are lots of familiar options for group dining in Beverly Hills, from hotel banquet rooms to iconic restaurants. But you won’t want to overlook a new addition to the neighborhood, the private dining rooms at Spice Affair, a beautiful new restaurant on La Cienega Boulevard’s Restaurant Row that serves contemporary, California-influenced Indian food. There are many restaurants in Los Angeles that specialize in Indian cuisine. Most of them have the decor which is similar to restaurants in India. Although the cuisine is mostly southern, some restaurants specialize in northern. However, Spice Affair is unlike any Indian restaurant we have reviewed. It is truly unique in its decor, as well as it’s cuisine. Anupam Bhatia, a world renowned specialist in Indian cuisine, the CEO of Spice Affair, has a restaurant in San Francisco which successfully created a unique flair with Indian cuisine, combining traditional Indian cuisine with the west. Spice Affair high ratings on review sites and regular celebrity sightings. Celebrities who have graced Spice Affair since its opening include Brittany Spears, Stevie Wonder, Abhay Deol, Gulshan Grover, and Pooja Batra, according to the owners.